Francis William (Frank) Ayliffe was born in Gloucester in 1892, the son of William Ayliffe, a fishmonger’s manager, and grew up at 116, Oxford Road, Gloucester, and later Eastgate Street, although by the time he signed up in 1914, he gave his address as Scots Craig, Elmbridge Road, Gloucester. Rather appropriately he first started playing rugby with the Franciscans, a local team which played on Thursday afternoons, and was renowned for providing entertaining rugby midweek. Frank played his first game for the Gloucester 1st XV away at Abertillery on 10th January 1914, and tasted defeat 3-14, but clearly the selectors liked what they saw of Frank. Although competition for places amongst the Gloucester forwards was exceptionally keen, his consistently good form immediately secured him a permanent place in the back row, and he played in 16 of the final 17 fixtures that season. On 14th February 1914, he scored his first try for the Club in a 30-3 victory over Llanhilleth, and added another in the 10-3 win at Bath. However, World War 1 then brought his burgeoning rugby career to a sudden stop. 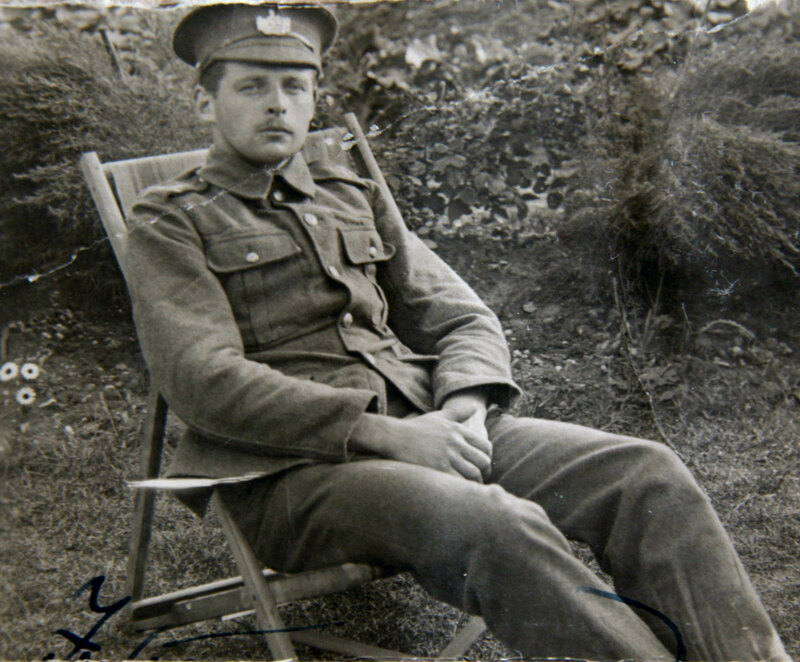 Like the majority of his teammates, Frank Ayliffe joined up with the Gloucestershire Regiment. Initially Frank had the rank of Lance-Corporal in the 1/5th Gloucesters before gaining a commission as a Lieutenant in the Worcestershire Regiment. On 16th July 1916 he was involved in severe fighting in France, and was wounded in both arms. He was taken to the 1st South Midland Casualty Clearing Station where his wounds were treated. Apparently one of the wounds was only flesh deep and was attended to with a field dressing, but in his other arm the bullet had penetrated the muscle and it was feared that the nerve was affected. He underwent two operations in France, performed by a Dr Finlay, who happened coincidentally to also be from Gloucester. He was then repatriated and transferred for further treatment to a hospital in Manchester and subsequently to Worsley Hall, which Lord Ellesmere had handed over to the War office for use as an officers’ convalescent home. Early in 1917 he was back in Gloucester, where he married Phyllis Mann. Fortunately, Frank recovered from his injuries, and along with Biddy Halford, Sid Smart, Charlie Cook and others, who were also among the casualties, he was able to resume his position in the Gloucester team when fixtures restarted in 1919-20. He continued to render splendid service for the next six seasons. In 1919-20, he played in 30 of Gloucester’s 33 fixtures, scoring 5 tries. This included a hat-trick of tries on 6th December 1919 against Cheltenham, an unusual feat fro a forward, and contributing to a comprehensive 33-3 victory. He also scored tries at Northampton and Cardiff. During this season, Frank stepped up to County level, and was selected for Gloucestershire in their successful CountyChampionship campaign, which led to a 16-11 victory over East Midlands in the semi-final. Yorkshire were conquered at Bradford in the Final on 17th April 1920, Gloucestershire, with 9 Gloucester players, winning 27-3, by 3 goals and 4 tries to a try. They played the second half of the game with only 7 in the pack after Arthur Hudson dislocated his shoulder. The “Athletic News” reported Frank as “Ayliffe, a strong young fellow who has very good hands but also does his share of work in the pack”. In 1920-21, he was again a regular in the Gloucester side, playing in 33 of the 37 fixtures. He again scored 5 tries, all in the second half of the season, against Leicester, Coventry (2), Newport and Manchester. During this season Frank played in all 5 of Gloucestershire’s matches, culminating in a magnificent 31-4 victory over Leicestershire in the County Championship Final at Kingsholm, with Frank one of the nine Gloucester players in the side. This Final was played in front of 10,701 spectators, who paid £1011 8s 0d on the gate, which represented record takings for any match at Kingsholm. In 1921-22, Frank played in 33 of Gloucester’s 41 fixtures, scoring tries in the traditional Boxing Day match against Old Merchant Taylors, and against Moseley. Some of his absences were again the result of County calls, with frank selected for all 6 Gloucestershire games. He scored a try in the 16-6 win over Somerset at Bristol, and was part of a nail-biting 8-8 draw against Surrey in the semi-final at Richmond. This resulted in a replay at Kingsholm, with Frank amongst the ten-strong Gloucetser contingent which triumphed 30-0 in “a brilliant display by the winners”. The Final was played away at Villa Park, Birmingham, against North Midlands, Frank playing his part in a 19-0 victory which meant that Gloucestershire retained their title as County Champions. Frank replaced Sid Smart as captain of Gloucester in 1922-23 and he led the Club to a successful season which saw them amongst the country’s leading clubs with a record of 27 wins as against 13 defeats and 3 drawn games, with points for 516 and against 273. The captain was elected by the players, and Frank was a particularly popular appointment, described at the time as “Frank Ayliffe got the full 100 per cent enjoyment out of his rugby. He was a fine sportsman, the jolliest of companions, extremely popular with his team mates, and this made leadership of the side a real pleasure for him.” During his season as captain, he played in 32 of 43 matches, scoring tries against United Services (Plymouth) and Llanelly. As captain he also recorded his first successful kick for the Club, a conversion against Devonport Services, and he again gave himself the kicking duties on 6th January 1923, when against Old Blues he landed 6 conversions out of 9 tries scored in a 39-8 victory. He again represented the County, but a 8-10 reverse against Somerset saw them out of the Championship after the 3 group games. In 1923-24, Frank handed over the captaincy to Tom Millington, but still played in 31 of the Club’s 39 fixtures. He scored a try in the first match of the season against Lydney, and the only try of the match against Guy’s Hospital. He also scored against Old Blues, in a match played for the benefit of the Gloucester Infirmary, Llanelly, Northampton (2) and London Welsh. He continued his part-time kicking duties in the absence of Millington, and was successful with 4 conversions against Cheltenham, and the one and only penalty of his whole career at Clifton on 8th December 1923. He made two further appearances for Gloucestershire against Devon and Somerset, but defeat in the latter match again saw the County eliminated at the group stage of the Championship. In 1924-25, Frank continued as a Gloucester stalwart, playing in 33 of the Club’s 40 matches, and scoring tries against Moseley (2), Cinderford, Newport, Old Blues and Richmond. He was not selected for the Gloucestershire side which played the All Blacks early in the season at Kingsholm, but was brought back for the County Championship games, which saw Gloucester squeeze through the SW Group with a narrow 6-5 win against Cornwall at Redruth, followed by a lucky 10-9 win over Middlesex in the semi-final at Kingsholm, before Leicestershire won the title with a 14-6 victory in the final at Bristol. In 1925-26, Frank was a veteran at age 33, but he still turned out regularly for Gloucester, appearing in 31 of 37 fixtures. He scored a try early in the season against Lydney, and another in the penultimate game of the season, on the final game of the end-of-season tour at Sidmouth – this was to be his last game for the Club on 20th April 1926, and a fitting way to bring a splendid career to a close. In 8 seasons for the Club, he had made 239 appearances, scored 31 tries, 11 conversions, 1 penalty and 118 points. For the County, he made 28 appearances, and represented Gloucestershire in four Championship Finals, winning three of them. Frank was later elected to the Club committee, on which he was still serving when he died at Wingrove, Barnwood Avenue, Gloucester on 22nd November 1942 at the age of 50. One of the most popular sportsmen and business men in the City, Mr Frank W Ayliffe, of Wingrove, Barnwood Avenue, Gloucester, died in the early hours of Sunday morning. He became ill last May and underwent an operation in the Gloucestershire Royal Infirmary. Although he improved enough to go to Liverpool to convalesce, he never made any proper recovery. Since his return to Gloucester his condition had become desperate. He was 50 years of age. Mr Ayliffe was the proprietor of a fish and poultry business at 4, Northgate Street, Gloucester, run under the name of Samuel Long. He inherited the business from his father, Mr W G Ayliffe. While he was well-known and greatly liked in the business life of the City, most of his many friends were to be found in sporting circles. A keen rugby football enthusiast, he was former captain of the Gloucester team and a County player. As a young man he played first of all for the Franciscans, a Thursday afternoon side, for which many Gloucester men who afterwards rose to the topof the game turned out, notably Mr Arthur Hudson, the present secretary of the Gloucester Club, and one of Mr Ayliffe’s closest friends. Later Mr Ayliffe joined the City Club, and eventually took the field with the First XV, in the 1913-14 season. In the last war he served with the 1/5th Gloucesters, playing football for the Regiment in France. He took a commission, and was transferred to the Worcestershire Regiment. He was wounded in the arm, but this did not prevent him resuming the game after the war, and he was again in the Gloucester side in 1919-20. Mr Ayliffe was a fast, bustling forward and helped his side to a number of notable victories. It was generally Ayliffe who backed up the brilliant breakaways by Arthur Hudson, and he was always there to take Hudson’s pass and secure the touch-down. In the season 1922-23, Ayliffe was elected captain of the Gloucester Club and that proved to be one of the most successful seasons Gloucester had. The team scored 516 points against 273. Business took him away from the game as a player earlier than otherwise might have been the case, but he continued to serve the Club, and was still a member of the Committee at the time of his death. Rowing was another sport which attracted his attention, and he was in several of the Gloucester Rowing Club crews. He was a Freemason in the Zetland Lodge, and held office as Steward. Mr Ayliffe married Miss Phyllis Mann, daughter of the late Mr W C Mann, and there will be a large number of friends to offer sympathy to Mrs Ayliffe in the loss of her husband. By the death of Frank Ayliffe the Gloucester Football Club loses one of its most enthusiastic and popular figures, and countless players and Rugby supporters, far beyond the confines of the city and county will mourn the passing of a splendid sportsman and loyal and generous friend. Rugby football was a passion with my old friend, and I well remember his early keenness to make good at the game. His playing record shows how splendidly he succeeded, for although the highest honours were denied him he figured in one unofficial trial – the annual match between Major Stanley’s XV and Oxford University – and was reserve in an England trial XV. In club and county football Frank Ayliffe achieved noteworthy success. He was honoured with the captaincy of the Gloucester team, made 28 appearances for Gloucestershire, and was a member of the side which won the County Championship on three occasions – 1919-20 (v Yorkshire at Bradford); 1920-21 (v Leicestershire at Kingsholm, a notable triumph), and 1921-22 (v North Midlands at the Aston Villa ground at Birmingham). In these matches he was contemporary with several players who gained international distinction – Arthur Hudson, Tom Voyce, Sid Smart, George Holford, Len Corbett, Reg Pickles and Sam Tucker – players who, with others equally well-known, brought fame to Gloucestershire in the Rugby football world, and kept the county in the forefront of for several years. A forward of marked ability, especially in open work, he enjoyed his football to the full and his playing days, I feel sure, were among the most joyous of a busy life. As a member of the Selection Committee of the Gloucester Club he seldom missed an away match, and his bright and cheerful company always delighted the “boys.” The Gloucester Club recognised the valuable services Mr Ayliffe had rendered by making him a life member – a distinction well deserved and fully appreciated by the recipient. Just a personal note. I have recently suffered a heavy bereavement, and can therefore deeply sympathise with the widow and relatives in the severe loss have sustained in the passing of one so highly esteemed – a real pal, popular with everyone, and withal a great sport. Many friends packed BarnwoodChurch on Wednesday afternoon to pay a last tribute to Mr Frank W Aylliff, of Wingrove, Barnwood Avenue, Gloucester, who died on Sunday. Mr Ayliffe, who in partnership with his brother, Mr E J Ayliffe, carried on the business of Samuel Long in Northgate Street, Gloucester, had a large number of friends not only in the business life of the city, but in Rugby football circles, in Freemasonry, and among members of the Royal Observer Corps. All these interests were represented at the funeral, and some people were unable to find room in the church. The service was conducted by Canon G F Helm, who said they were not saying “good-bye” to Frank Ayliffe, because his spirit would be with them for all time. “We had come here because there was a great deal to admire in him” he said. Rugby football representatives who attended were: Messrs A T Voyce (Rugby Football Union), Eric Keys, Ralph A Roberts, W A Thomas, T H Millington, M Neale (Gloucestershire Rugby Football Union), A Alcock, A Hudson, R N Loveridge, J G Holford, G Hudson, J G A’Bear, F Martin (Gloucester Rugby Football Club), W Avery, E T James (Gloucester Supporters’ Club), W Jones, S P Ball (Old Cryptians), N I Leach (Gloucester Old Boys), W Bailey.